Back to 2015 The Spirit of ANZAC - 1915. Forward to 2017 The Darkest Hour - 1917. 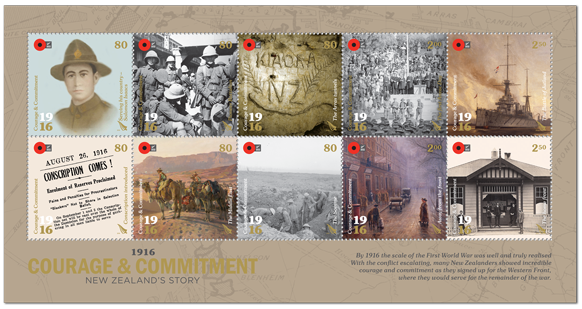 Here is the third annual instalment (of five) in New Zealand’s homage to the Great War (World War I). 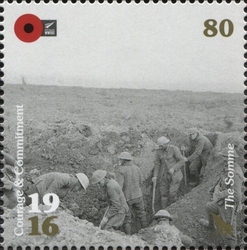 The multiple issue format is unchanged – a set of twenty stamps: a block of six, two se-tenant pairs and a sheetlet of ten; two miniature sheets, one of six and one of four; and a commemorative prestige booklet containing twelve booklet panes. By 1916 the scale of the Great War had been truly realised. 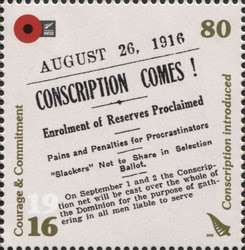 At home, volunteers for service had slowed to a trickle and to keep up with the ever-increasing demand for more men to fight, conscription was introduced. 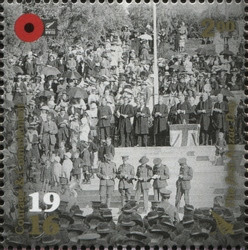 In New Zealand, the first Anzac Day was observed a year after the Gallipoli landings. As the battle moved to the Western Front, the courage and commitment of the servicemen were sorely tested. Our main writer on these kinds of subjects has rejected this series completely so I've picked it up and will try and do what I can to make it fly, but I must confess to lacking knowledge of World War I. A full miniature sheet of all 10 stamps. Top Row:- 80c - Solomon Isaacs; 80c - The Pioneer Battalion; 80c - The Arras tunnels; $2.00 - The first Anzac Day; $2.50 - The Battle of Jutland. 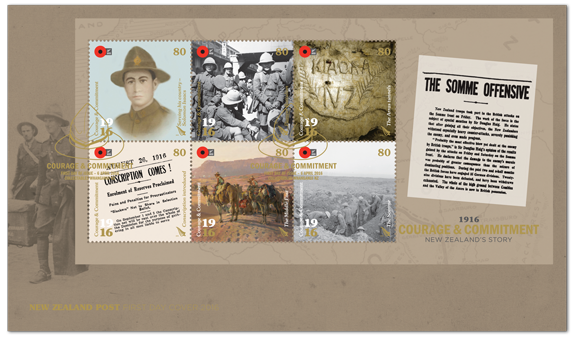 Bottom Row:- 80c - Conscription; 80c - The Middle East; 80c - The Somme; $2.00 - Away from the front; $2.50 - The home front. The Stamps in More Detail. 80c Solomon Isaacs – Serving his Country. 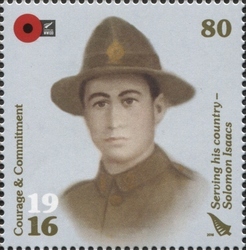 Originally from the Cook Islands, Solomon Isaacs was one of many Pacific Islanders who volunteered to serve in the First World War. For nearly three years he was overseas in the 3rd Maori Contingent, the Pioneer Battalion, the New Zealand Tunnelling Company (NZTC) and the Rarotongan Company. He returned to Tautu, Aitutaki in 1922. Made up of Maori and Pacific Islanders, the Pioneer Battalion (or the Maori Pioneer Battalion) was among the first New Zealand units at the Somme in September 1916. They eventually returned to New Zealand in 1919. The NZTC built roads and, more significantly, dugouts and tunnels underground near Arras 1916-1917. 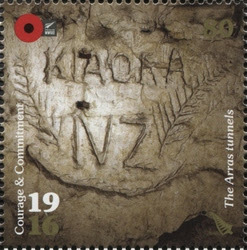 The Arras tunnels incorporated the names of many New Zealand cities and towns; depicted is the Maori greeting Kia Ora, which means ‘be well’ or ‘be healthy.’ The Arras Tunnels were much older, having been used as mines for many years. The Allies, including the New Zealanders, opened then up and extended them far under the German lines. As the war dragged on the steady stream of volunteers began to drop off while the army had an ever-increasing demand for more men. The Military Service Act became law on 1 August 1916. Compulsory enlistment in the armed forces for national service arrived by 15 September 1916. 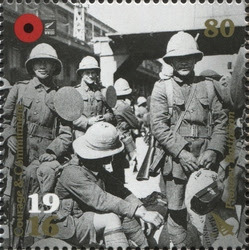 In the Middle East theatre, the ANZAC Mounted Rifles Division, the Imperial Camel Corps and the Egyptian Expeditionary Force fought the Battle of Magdhaba and pushed back the Ottoman forces from the Suez Canal. In September 1916 some 15000 NZEF troops commenced fighting the Battle of the Somme in northern France. In terms of human lives lost this was one of New Zealand’s costliest campaigns of the war – by the time the NZEF and artillery were withdrawn, 18 November 1916, approximately 2000 had been killed and 6000 wounded. $2.00 Away from the Front. Bloomsbury Square, London became the headquarters of the NZEF in the UK. This was the base for New Zealand servicemen from the Western Front while on leave or while waiting to deploy or return home. $2.00 The first Anzac Day. 25 April 1916 saw Anzac Day church services throughout New Zealand. Depicted is the service held in Nelson Church. One hundred years later it is still a major event in New Zealand, celebrated by many. Where once those soldiers who had returned once marched now it been taken up by the younger people, even schools have become involved. $2.50 The Battle of Jutland. This largest naval battle of the First World War took place on 31 May 1916. HMS New Zealand joined the British Royal Navy’s Grand Fleet under Admiral Sir John Jellicoe and engaged in battle in the North Sea near Jutland in Denmark the German Navy’s High Seas Fleet under Vice-Admiral Reinhard Scheer. The HMS New Zealand was a British ship but many of the crew came from New Zealand. 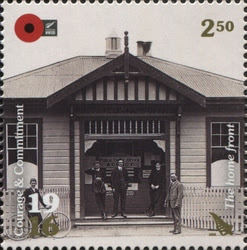 Letters, postcards and telegrams were essential means of communication between New Zealand and those on active service. 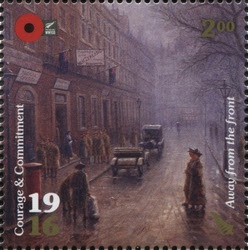 Many packages of home comforts were also sent to the front line. Depicted is Kaikoura Post & Telegraph Office. Miniature Sheet First Day Covers. 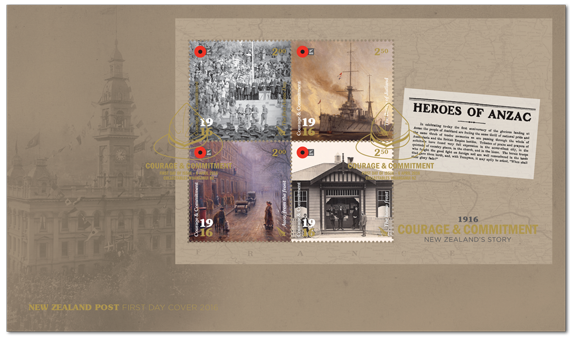 The larger values miniature sheet FDC. 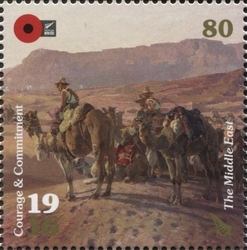 The 80c stamps miniature sheet FDC. Date of issue: 6 April 2016. 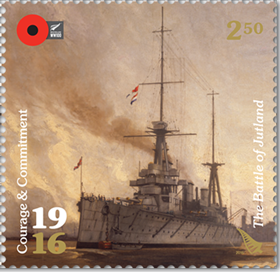 Period of sale: These stamps remained on sale until 5 April 2017, First day covers remained on sale until 5 June 2016.